Purism carries on with its ambitious plans to be the first manufacturer of brand new laptops to ever receive the Free Software Foundation‘s Respects Your Freedoms (“RYF”) certification. Please note that FSF “RYF” certification is for hardware, and is different than FSF certification/endorsement for the operating system (PureOS), which we have already obtained. The “RYF” certification is the most strict endorsement you can get in the industry. 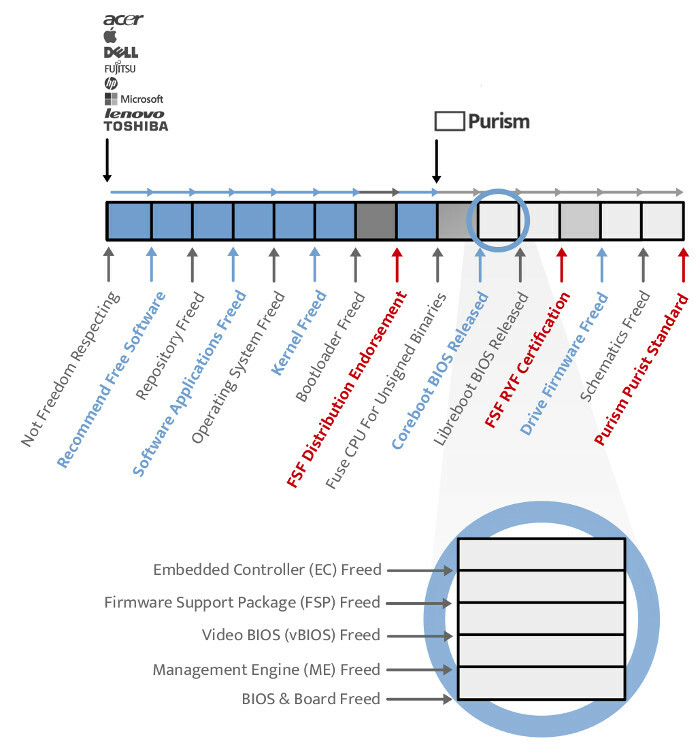 Since the question “Why doesn’t Purism already have the FSF’s RYF certification?” comes up regularly, we are providing below a visual roadmap and status updates on our progress, on the hardware front as well as software. Please note: the graphic above is outdated (compared to the text on this page). We’re planning to redesign it. We have completed the multi-year process to get FSF Distribution Endorsement for PureOS. You can see the official announcement from the FSF here. FSF “RYF” hardware endorsement is a different matter and will come later as we make progress on the hardware roadmap. Purism is replacing the proprietary BIOS by coreboot in its Librem laptops, and will continue to do so and dig deeper to free/reverse-engineer firmware blobs and other parts of hardware over the long term (see status updates below). Purism has tested and demonstrated the neutralizing of the Management Engine itself, will be enforcing this into its coreboot-enabled laptops, and is continuing towards neutralizing or freeing the remaining parts. Purism is considering shipping only NVRAM drives. Purism offers the first high-end security and privacy-respecting laptops (with a heavy emphasis and best effort towards maximum software freedom) by manufacturing the motherboard and casing, and sourcing daughter cards, where all chips are selected and designed to run free software at the operating system level. Purism laptops are completely free from the bootloader through the kernel (with no mystery code, binary blobs, or firmware blobs), including the operating system and all software. Additionally, Purism laptops are “99%” free at the BIOS level (see the history of our coreboot involvement), where we disable and remove/neutralize the Intel ME binary but we have yet to free the Intel FSP binary. We are working diligently to free the (minuscule) remaining bits at the BIOS level in order to move us toward FSF “RYF” endorsement, but our goal is to go further than that: Purism also intends to free the firmware within HDDs and SSDs. Librem 13 coreboot report – February 3rd, 2017: It’s Alive! We will update this page as we progress toward FSF RYF endorsement and beyond. See also the many other pages in our “Why Purism?” section, including our coreboot page. If you are a talented hacker, driver developer or reverse engineer, and are interested in helping us free the remaining low-level hardware components, please send us an email about that.